Welcome to the Chester, NH Historical Society Website! 2010 reenactment of 1910 photograph (inset). Please use the menu (and links) above to navigate through the site. 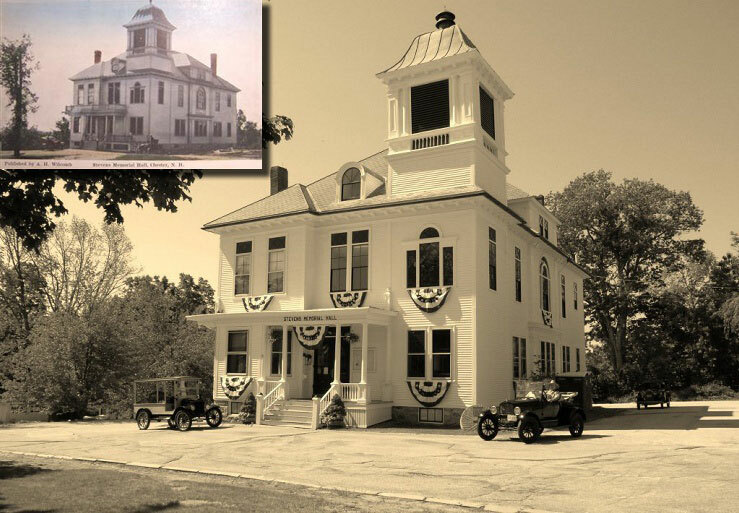 The Chester Historical Society holds bi-monthly meetings (January, March, May, July, September, November) on the 4th Monday, at 7:00 P.M., at Stevens’ Memorial Hall, at the crossroads of Rts. 121, and 102, in Chester. Membership is open to all individuals, families, businesses, and organizations. The Society’s Office and Exhibits at Stevens’ Memorial Hall are open on the 2nd Saturday of every month from 10:00 AM to 12:00 PM. Please use our Contact Us page if you would like more information or would like to contribute.